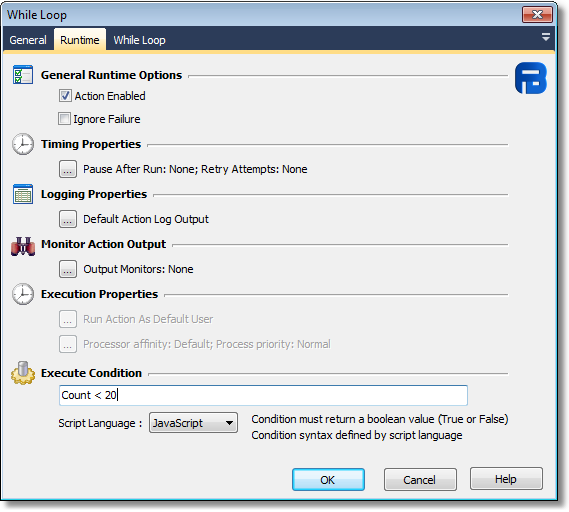 The While Loop action will run a set of actions (the child actions of the While Loop) while it's Condition (specified on the Runtime tab) evaluates to True. The While action has no specific functionality other it's looping capability (specifically it tells the stepping engine which action to run next, overriding the default behaviour). NOTE: Note that it will execute its script events (like any other action) first before executing it's child actions. What this means is that the While Loop Action will execute it's AfterAction Event Before any of the Child Actions are executed. The reason for this is that the stepping engine does not have any knowledge of which type of action it is executing and does not treat the while loop action any differently. While a While Loop is an iterator, it does not share any of the common iterator script events and properties.